It is in serving the least of his day that Francis experienced perfect humility and minority. A man of great conversion, Francis is probably most well-known for dramatically renouncing his earthly wealth and high social status in order to minister to the lepers, those people so sick and disgusting that they needed to live outside the city (and wear a bell so that people could run away when they heard them coming.) 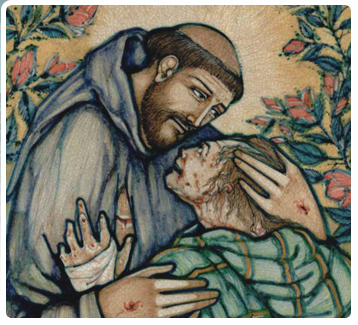 The Franciscan charism follows in his example: As members of the Order of Friars Minor, the “lesser brothers,” we are called to live a life for the poor, with the poor, as the poor, renouncing any sort of wealth, power, or status, that would nurture a feeling of entitlement or honor. The lowest in society do not expect to be served or cared for, they know that they must serve others. That is what Francis wanted. When I look at my own life, I struggle to identify a single way in which I am a minor in our society: I am a young, white, college-educated, middle class, heterosexual male, born in the United States to parents that are still married, a member of the largest religious organization in the world, and have no mental or physical disabilities. If that’s not enough, I joined one of the largest religious orders in the Catholic Church, giving me tremendous (and largely undeserved) respect as a religious and future member of the clergy. In literally every way that I can imagine I find myself among the privileged in society. As I watch news coverage of the recent boarder crossings and immigration laws in Arizona and Georgia, I know that I will never be “randomly” stopped on the street and forced to prove that I belong, have to flee one country into a country that does not want me, or have to worry about my rights when abroad. As a male, I know that I will never be given less money for doing the same job as a co-worker, fear being alone outside at night, or constantly have to prove my self and my gender as not inferior. As our church and country continues to understand homosexuality, I am made aware that I have never had to worry about how my sexuality or sexual orientation could offend someone, what people might think of me if they found out, or being thrown out of my house by my parents. This list could go on and on. As I look out into the world, I see people being discriminated against and made “lesser” in our society each day, and it is never me. I doubt it ever will be. And so I’m faced with a challenge. How do I ever become “lesser” in society? How do I ever even approach minority when things like race, gender, sexual orientation, education, and physical capability are not exactly things that can be stripped and handed to a bishop? It is here that I would normally have a conclusion like, “For me, what’s important is… The key is… I’ve found that the best answer is…” Unfortunately, my reflection today is a little less complete than normal. The fact of the matter is that I simply do not know and I will have to sit with this struggle for a while longer. There are obviously some things that I can change, e.g. how I spend my money, with whom I associate, how intentional I am at being with the poor. As I leave formation and entire into a little more autonomous life as a friar, I know that there will be a little more freedom to choose where and how I live, and what ministry I do, making this a little easier to live out. And yet, there is a part of me that realizes that I will never be the least in society and I am struggling to accept that. How can I say to be a friar minor, an imitator of Jesus and Francis of Assisi, with so much respect, authority, privilege, and “wealth,” both civilly and ecclesiastically? I don’t know. For now, all I can do is realize that this “great privilege” I have in our society is nothing but a lucky ticket in the womb lottery: I have done nothing to deserve it and ultimately am no better off than anyone else because of it. I am what I am before God, and nothing more. This is a bit of wisdom that I must always keep with me. For though I may never be able to fully renounce all that separates me from the least in our society, I know that there is always a full reserve of pretension, entitlement, and arrogance just waiting to be given up inside me. If I want to be minor in society, it starts with the attitude I bring to every situation: I am here to serve the people of God with perfect humility and minority, and they do not owe me anything because it is God who is truly doing all the work. Another gem from Brother Casey. How I love everything he writes. First i want to thank you for writing this blog. I have followed it since you started writing. I have had struggles with Catholicism since we graduated and this blog has keep the Catholic Church real to me and kept me connected. In response to this post specfically while i admit it is hard to be able to be lesser in this society with the background you or me for that matter have been gifted. I think St Francis life does provide a guide for your problem.. Maybe in another society separate from the US you would be able to experience some of the otherness of life. I remember back when you posted about summer assignments you have some say in the selection. Maybe next year you can see if you can be assigned to another country or location where you would have to deal with not being in the racial majority or religious majority and having to struggle with the language. Maybe that experiance will help you see where God has called you serve. While Catholicism is one of the largest religious in the world there are places where it is a minority that is not respected and struggles to hold onto its existence. Hi Friar Casey! Interestingly this morning the “Catechism in a Year” daily e-mail discusses corporal acts of mercy and spiritual acts of mercy. I believe Catholics should strive to do more of both. In any case, it’s not so much a matter of becoming “lesser” to understand and meet the needs of the poor in spirit/material/etc. but it is just as important to recognize those in need and providing a way to deliver to their needs. Case in point – my wife and I moved from St. Mikes in Cary to a Chicago suburb. It’s really a nice area, lots of good people. However in the city of Chicago we have a lot of gang crime, and that’s translating into a record number of shootings. 94% of the victims are racial minorities. It’s only September and we have had just under 1,800 shootings in just the city alone. Interestingly I’m also heavily involved in Scouting, and membership in these same areas have been dropping steadily for the last several years. The numbers are incredibly low (2% participation rate for 6-18 year olds) in a place where Scouting in the US first started just over 100 years ago. As a result we have a cultural problem where youth are not receiving “citizenship formation” lessons, and their role models become gang leaders. So we’re actively starting an aggressive grassroots campaign to kick-start Scouting in Chicago and find ways to address the problem. It may take several years, but until we intercede with both corporal and spiritual acts of mercy, bringing ourselves to their position isn’t helpful – instead it would only worsen the problem. Imagine a kid suddenly realizing that there’s something to do other than run loose on the streets…just like the kids back home who found Lifeteen, it became a place to go, learn and grow. Scouting has opened doors for many over the years and we hope it will help change values in Chicago. Bless you and keep up the good work. We’re very proud of your growth and enthusiasm.